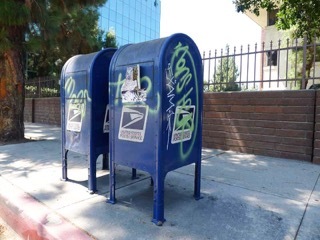 Graffiti is a crime that generally occurs when vandals deface properties for destructive purposes, hate crimes, or to indicate drug and gang activity. Other misguided individuals vandalize properties to showcase their tags and “pieces” on your homes, businesses, vehicles, etc. The results of which are a nuisance to property owners. Graffiti also contributes to the perception of blight, discourages economic development, and lowers property values in the affected areas. We can quickly and confidently remove all types of graffiti from all building surfaces without causing any environmental harm by using 100% biodegradable products. They are EPA compliant (Environmental Protection Agency) and VOC compliant (volatile organic compounds) and contain no phosphates, chlorinated hydrocarbons, Xylene or any other products known to cause health or disposal problems for graffiti removal technicians. Also, the products we utilize are used sparingly and capable of removing a large amount of graffiti without unnecessary waste or run off. Newly Restored does not use harsh chemicals and products to remove graffiti and paint. We offer a 100% satisfaction guarantee because we stand behind our promise to provide quality service. Call us for a free estimate!